Already I can see that the beginning of the new year is going to be a tug-of-war between the wanting-to-detox me, and the part of me that thinks that butter and cheese are inalienable rights to be defended Minutemen-style with muskets and bayonets. I know that I swore to lighten things up after the holidays, but after about a day of that, I was starving. And when you’re starving, you need carbs. You need fat. You ideally need carbs and fat baked together with bacon. I suppose that if you wanted to make this slightly healthier, you could substitute whole wheat pasta for the regular pasta, but I have never been the biggest fan of whole wheat pasta. Maybe it’s a texture thing. I used the horseradish cheddar cheese (what was left of it after New Year’s), and the Irish bacon from my farmer to pull this together. Two, count ’em, two CSA products in one dish! Whoo hoo! 1. Preheat the oven to 350°. Bring a large pot of salted water to boil. Add the pasta and cook it until it is slightly under al dente. Drain it, and set it aside as you prepare the rest of the dish. 2. While the pasta is cooking, brown the Irish bacon in a large skillet. As Irish bacon is leaner than regular bacon, it will not be as crispy when cooked. Once the strips are browned and most the fat has rendered, transfer the bacon to a paper towel-lined plate to drain. 3. In a medium-sized sauce pan, melt 4 tablespoons of butter over medium-low heat. Once the butter has melted, stir in the flour. Cook the flour for about a minute or two (you want to get rid of that raw, floury taste). Once the flour has toasted a little, add the milk all at once and whisk everything together. Raise the heat to medium, and continue to whisk the sauce occasionally as it thickens. 4. Once the sauce has thickened, turn off the heat and stir in the cheese. Continue stirring until all the cheese has melted. Adjust the seasoning. 5. In a large bowl, combine the pasta, the bacon, and the cheese sauce. Spoon the mixture into a large buttered baking dish. 6. In a small sauce pan, melt the remaining tablespoon of butter over low heat. Toss the panko or breadcrumbs in the butter, and then spread them evenly over the top of the pasta. Bake the mac & cheese for about 30 minutes. The top should be golden brown, and the cheese sauce should be bubbly. 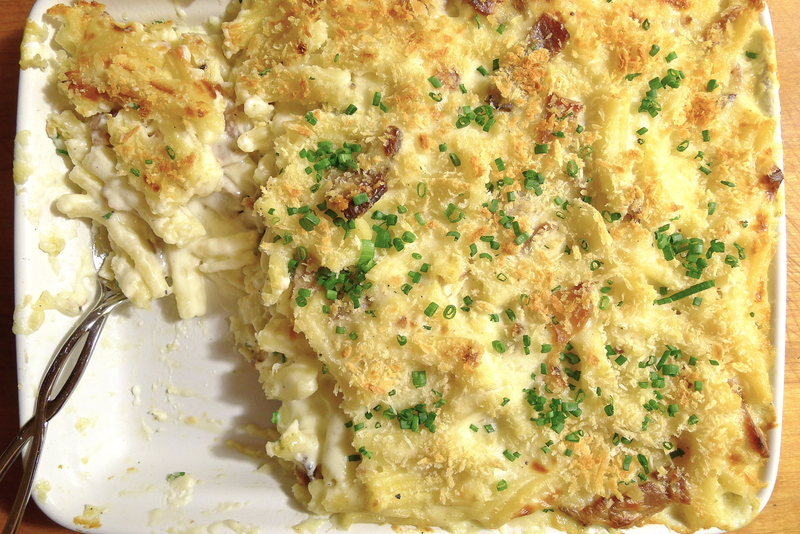 If the cheese sauce is bubbling, but the top has yet to brown, you can pop the dish under the broiler for a minute or two to toast the breadcrumbs. Let the dish rest for about 10 to 15 minutes before topping it with freshly snipped chives and serving. I too can’t stick to “healthy” regimes because of my guilt-free fondness of carbs. Love the sound of this mac and cheese. Thanks! What is really unhealthy is feeling horrible and guilty about food. I always feel so sad when I hear stories about people who are miserable from depriving themselves. I try to keep portions as reasonable as I can, and try to work some roughage in there somehow . . . ! I love comfort food. Every now and then, a girl needs Mac and cheese. I don’t know about resting it for a time at the end though. I resting is just a myth. You are supposed to eat it hot out of the oven so you can scoff it while sucking in cool air to minimize the burning sensation. Don’t pretend you don’t do that! Yeah, I’ll fess up: I do do that! Have burned my mouth many, many, many times! Have you ever just swallowed a nuclear hot mouthful of food and felt it searing its way to your stomach? And then you take another nuclear mouthful seconds later? That’s me too! I am never showing my husband this post as he’d have me making this every night. Definitely not New Year light eating but wow. Awwww! It’s true: you can’t want what you don’t know about. Thanks for the comment! Woweee! Woweee! Me want nowee! Oh does it look goooooodddddd! No calories, right? Have you ever read Nigella Lawson’s How to be a Domestic Goddess? In it she details how she evaluates calories in food: basics like butter, flour, oil, and sugar don’t count. Vegetables don’t count. Staples like bread, pasta, rice, basically any starch don’t count. It’s pretty hysterical! I’m going to check that book out. Heck yeah! Let’s do it!!!!! Do you have my email address? Send me a message and let’s win this thing!!!!!! i do not! You can facebook Eryn Stutts though! I am one of the stubborn anti-facebookians. I’ve never had an account. As a result, I miss birthdays, baptisms, weddings, housewarming parties, and all kinds of fun stuff . . . but I gain stealth and “untrackability”! I think that in one of the WordPress thingies that they send, they include email addesses. I just sent one to you! Let me know if you don’t get it!